Pimas is able to product samples in a small time, thanks to its own technologic equipment, in particular, the MyData JetPrinter and the MyData Pick and Place. 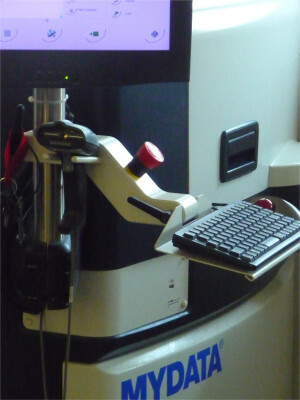 MyData JetPrinter is a programmable machine for the depositing of solder paste on the PCB. It is possibile to set the layer thickness of the solder paste, that can vary depending on the components to be mounted: for example, the quantity of solder paste to be deposited for a BGA microcontroller must be significantly lower than that for a Melf Zener diode. This leads to a high reliability on the soldering process. The posititioning of the SMD components on the PCB is very fast thanks to the MyData Pick and Place. A new Vapor Phase Oven with Vacuum Technology. 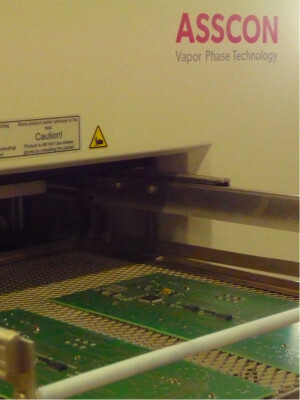 This equipment, recently adopted by Pimas, represents the ultimate technology as regards the vapor phase oven, and guarantee a high quality in the soldering process. It is strongly recommended for specific components, such as microcontrollers in BGA cases, or for the IMS technology, to avoid the formation of "voids" or discontinuity points during the process of solidification of the pond. Only this procedure ensures a complete and reliable welding. Finally, soldering of the PTH components is guarateed by the automatic soldering wave machine.